As life evolves, the holidays can become, well, complex. It can be impossible to have everybody in the same place at the same time. So, one reason Thanksgiving has expanded to almost a full week is the need to have multiple meals for different parts of your family. Our Thanksgiving turkey need to be on Saturday. So, what to have on Thanksgiving Day itself? We had this lovely rabbit recipe. 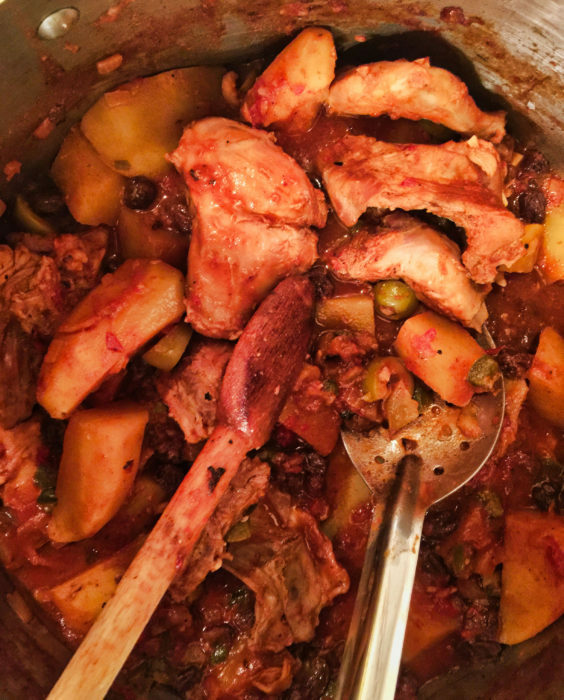 It’s an upscale Cuban recipe with saffron, capers, raisins, and olives. Oh, and rabbit! Does rabbit taste like chicken? Yes. But meatier and denser. We’ll happily revisit this recipe any holiday week. If you have never tried rabbit, hop to it! Place the rabbit pieces in a deep skillet or Dutch oven over medium heat along with the onion, garlic, and green pepper. Season with saffron, cumin, salt, pepper, lemon juice and the bay leaf. Pour the water over all. Bring to a boil, then simmer for 20 minutes. Add the potatoes, and cook for about 20 more minutes, until tender. Add the raisins, capers, white wine, tomato sauce, olives and olive oil. Simmer for about 5 more minutes. Finally, stir in the peas and remove from the heat.